AZ3146 is a selective Mps1 inhibitor with IC50 of ~35 nM, contributes to recruitment of CENP-E (kinesin-related motor protein), less potent to FAK, JNK1, JNK2, and Kit. Dose response curves for the treatment of breast cancer cell lines in the absence or presence of escalating doses of the TTK inhibitor (TTKi) AZ3146. The survival of cells was measured using the CellTitre MTS/MTA assay carried out 6 days after treatment. Percentage survival (n ¼ 3 per dose) was calculated as the percentage of the signal from treated cells to that from control cells. Oncogenesis 2014 21, 3:e100. AZ 3146 purchased from Selleck. Following single thymidine arrest (STA) for 24 h (the numbers above the arrows indicate the time in hours), cells were released into nocodazole (Noc) for 12 h and then treated with DMSO or Noc plus MG132 (to prevent mitotic exit). After 2 h, cells were processed for immunoprecipitation (IP). cells were synchronized using AZ3146 or other small molecule inhibitors. Cell lysates were then analyzed for BUBR1. Noc, nocodazole. J Biol Chem 2013 288(49), 35149-58. AZ 3146 purchased from Selleck. Hewitt L, et al. J Cell Biol, 2010, 190(1), 25-34. FRAX597 is a potent, ATP-competitive inhibitor of group I PAKs with IC50 of 8 nM, 13 nM, and 19 nM for PAK1, PAK2, and PAK3, respectively. 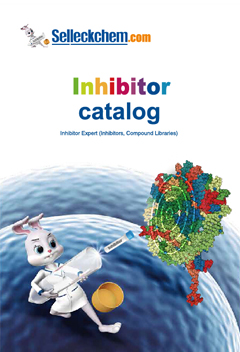 VER-155008 is a potent Hsp70 family inhibitor with IC50 of 0.5 μM, 2.6 μM, and 2.6 μM in cell-free assays for HSP70, HSC70, and GRP78, respectively, >100-fold selectivity over HSP90. PU-H71 is a potent and selective inhibitor of HSP90 with IC50 of 51 nM. Phase 1. 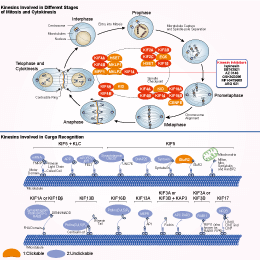 Ispinesib (SB-715992) is a potent, specific and reversible inhibitor of kinesin spindle protein (KSP) with Ki app of 1.7 nM in a cell-free assay, no inhibition to CENP-E, RabK6, MCAK, MKLP1, KHC or Kif1A. Phase 2. Features:An allosteric, potent, specific, and reversible inhibitor of the mitotic kinesin spindle protein (KSP) (HsEg5). SB743921 is a kinesin spindle protein (KSP) inhibitor with Ki of 0.1 nM, almost no affinity to MKLP1, Kin2, Kif1A, Kif15, KHC, Kif4 and CENP-E. Phase 1/2. GSK923295 is a first-in-class, specific allosteric inhibitor of CENP-E kinesin motor ATPase with Ki of 3.2 nM, and less potent to mutant I182 and T183. Phase 1. Features:The first potent and selective inhibitor of CENP-E.
MPI-0479605 is an ATP competitive and selective inhibitor of mitotic kinase Mps1 with IC50 of 1.8 nM, >40-fold selectivity over other kinases. ARQ 621 is an allosteric, and selective Eg5 mitotic motor protein inhibitor. Phase 1.